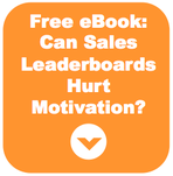 People who don’t run sales contests tend to wonder whether doing so might demotivate poor performers. Won’t landing on the bottom of a leaderboard harm morale? In some cases, it can. In the cases of well-designed contests, though, it will drive motivation. I love my sleep, so if I’m going to get up early to head to the gym, I try to make it worth it. I took that into account this morning when I set the stair stepper on level 8. I lifted one foot at a time and tried to embrace the somewhat calm atmosphere that is the Detroit gym on an early Tuesday. Then it happened. This gargantuan of a man jumped on the stair stepper next to me. Towering, muscular…I’d place serious bets on pro athlete. Lineman. As soon as his machine fired up, I couldn’t help but look over. He literally began leaping over stairs. Shock came in two parts: that the machine could spit out stairs so quickly and that this man could clear them at the same rate. Suddenly, my climbing seemed sloth-like. Within a minute I noticed that the man’s performance came in intervals, and his slow pace matched mine. For some crazy reason my competitive side lit fire. I knew I had to race him. And then I forgot about that man. (Which says a lot when you have a 6’ 7” superhuman rapidly jumping hurdles just to your left.) I set my own goals. I typically aim for 30 minutes, 1,000 steps; today I wouldn’t leave until I reached 2,000. With 31 minutes on the clock, I felt like I should thank the man. I let out a wheeze and knew that would have to do. On the way to the locker room, I thought about how easy taking my regular routine up a notch will be tomorrow. Afterward, I realized that companies like PayPal, Dun & Bradstreet and Kelly Services use competition to motivate diverse performance levels in the same way I experienced motivation this morning. Think about it: If that athlete had another “top performer” next to him, it would have probably pushed him to work harder. Or who knows? Maybe even a hard-working lower performer would make him think, “If she’s going at it longer, harder, so should I.” Just like that, his performance would stretch that extra inch. As for the bottom-level performers – the ones many worry about demotivating – they’ll often motivate themselves. It’s important to note that this only happens in healthy environments. If I had a trainer in my face this morning announcing my lack of athleticism, I would have had an entirely different experience. That being said, I found motivation even though I knew I wouldn’t “win.” I simply saw that someone could do it – someone could seriously get after it on the same machine, in the same early morning. That both inspired and challenged me. We regularly see contests do the same. Those on the bottom of the leaderboard know they probably can’t reach the top, but once they see that new product can be sold, or that sales pitch can turn to demos, it inspires them to get active. As a bonus, sometimes they will even actively seek out coaching from their peers and/or leaders to help them achieve more in that contest – and eventually as a professional, as well. As for the middle-level performers, it’s the same sort of thing. Contests show them not only where they stand, but also what they’re capable of doing. It fuels their competitive nature. So they’ll improve performance, too. And that’s not even it. Sales contests can – and should – be paired with recognition and coaching. Those layers will take performance even higher. Now, just imagine that instead of running stairs this morning, that man and I were booking demos (or carrying out any other critical, revenue-driving activity). I’d have booked double the amount as usual, without even coming close to winning the contest. And that’s the whole point. One morning at the gym turned into a lesson about sales contests. Turns out, competition even motivates those performers who know they can't win.